I mentioned earlier this year that one thing on my AWI radar is to bulk up existing units to ensure they are of sufficient strength to cope with all relevant scenarios. 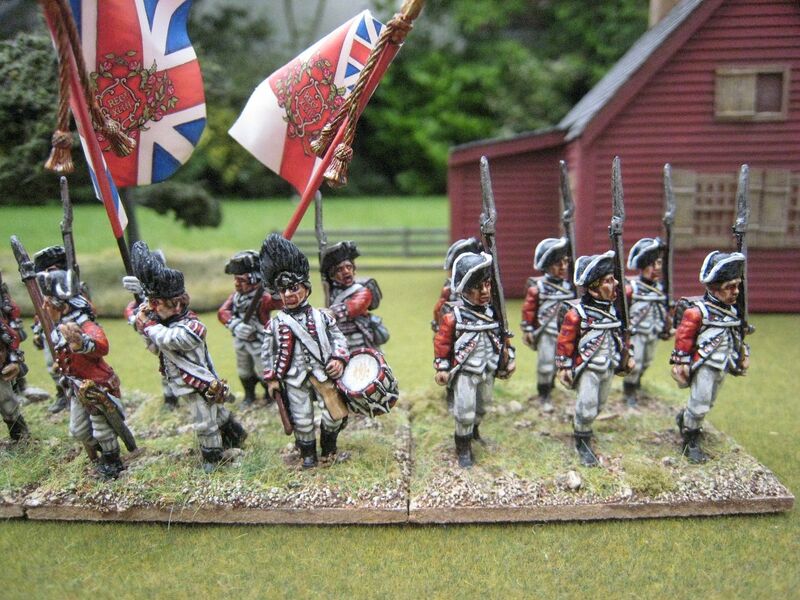 I keep a detailed spread-sheet of all units that feature in the published "British Grenadier!" scenarios and seeing regiments listed as "done" but with insufficient figures for the latest scenarios irritated my completist's mentality. I hadn't meant to make a start on this work now, but I found some spare figures and painting them now would further my aim of painting all remaining AWI lead by the end of the year. Of course it's in the nature of wargaming that finishing this task meant I had to buy a couple more packs of figures at Salute, but since they were largely painted immediately afterwards so the lead-pile hasn't been increased. 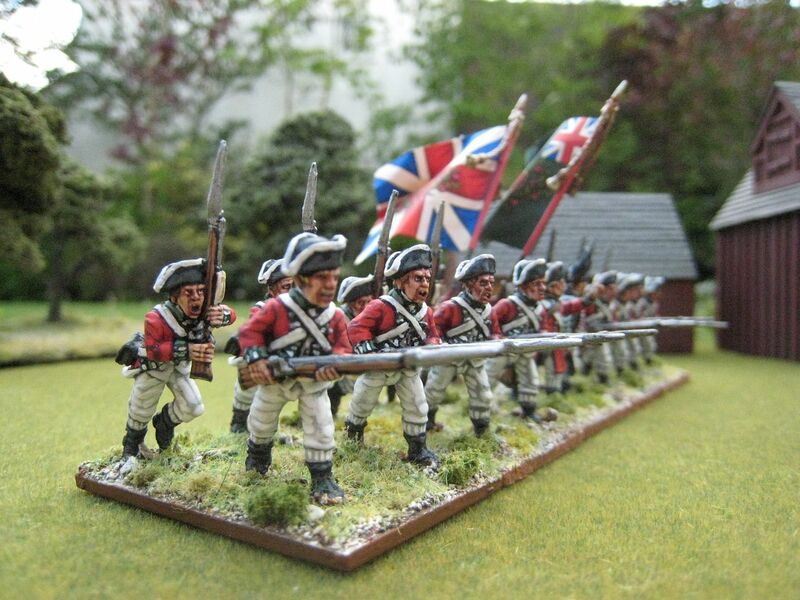 I realised that this "bulking up" project naturally falls into 4 stages: (i) units requiring Foundry figures in full/1768 Royal Warrant dress; (ii) units requiring Perry figures in campaign/cut-down coat dress; (iii) Hessians and Brunswickers; and (iv) units for the Guilford Courthouse scenario (this was originally presented in the first edition "British Grenadier" rulebook, but an amended version with different unit strengths appears in the 4th scenario book). So that's probably the order in which I'll approach this sub-project. I don't intend to re-do all my earlier blog posts about these units - I'll post pictures of the new figures as I go along and I'll add additional "group" shots to the original posts. So first of all, here are the figures in 1768 Royal Warrant; this is a post that has been some months in the making! 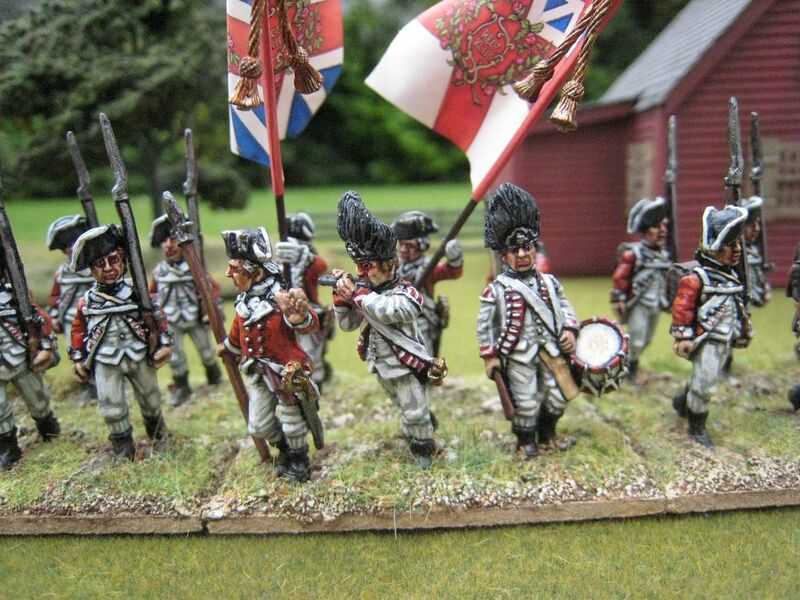 These figures are the first Foundry British line I've painted for years. Painting the marching figures took some getting used to, as they have a lot of kit and fiddly straps which one doesn't have on "campaign" dress figures. That said, the firing line and charging figures were easy in comparison, as they don't have any kit other that the cartridge and bayonet belts. 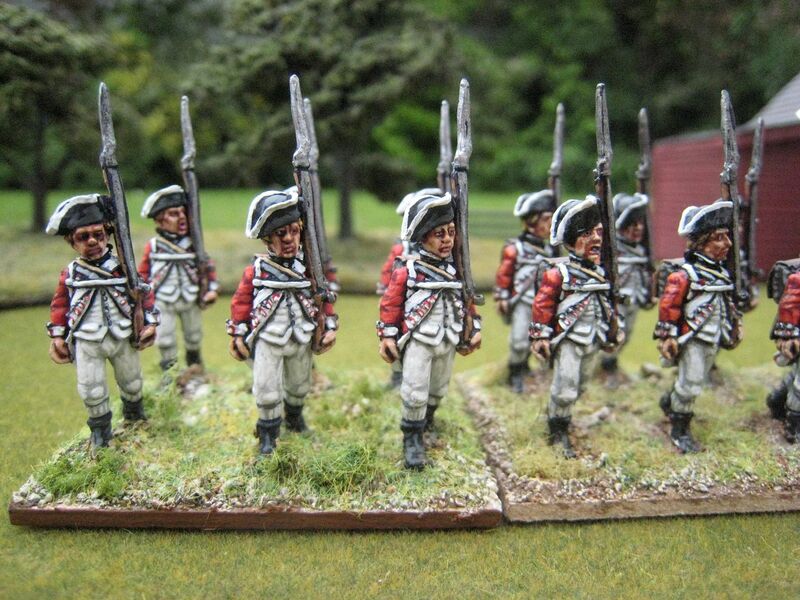 I did a small amount of remedial work on a few of the original figures, some of which were painted as far back as 2003, when I first started out on my AWI odyssey. First, I needed an additional 6 figures for the 38th Foot. 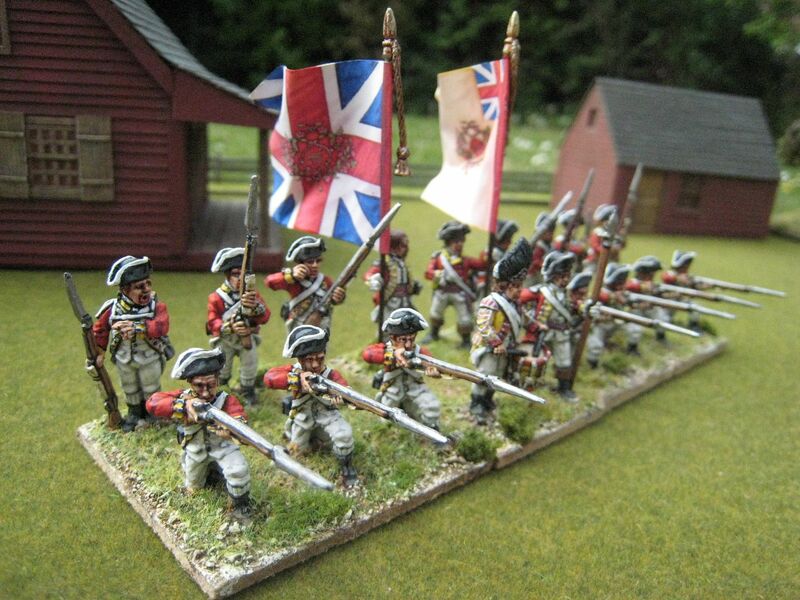 This is a useful battalion to have as it appears in the following scenarios: Bunker Hill (18 figures), Long Island (16), Fort Washington (12), Brandywine (16), Springfield (24). 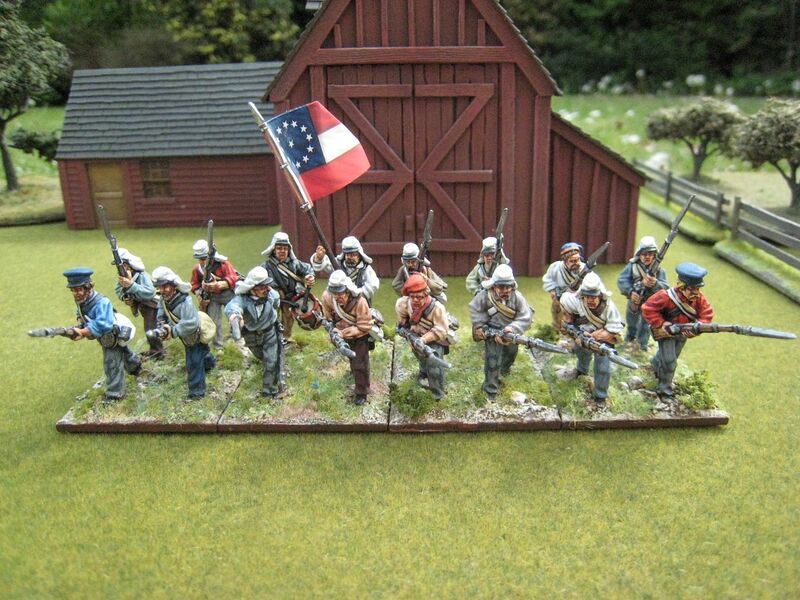 I already had the battalion based in sixes for Bunker Hill so I've added a 4th base of 6 figures to take it up to the 24 figures required for Springfield. That battle was fought in June 1780, and it's highly unlikely that at this stage the 38th was still in un-modified "full warrant" uniform. But I don't think it's worth painting a whole new unit in modified campaign dress just for that scenario. 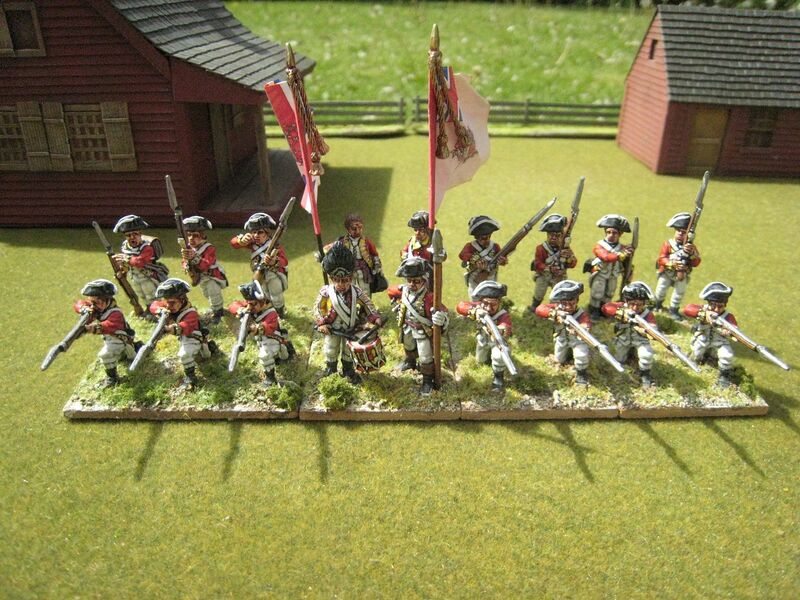 Secondly, the 63rd Foot needed 10 more figures to take it up to 30 for the Hudson Forts scenario. The 63rd appears in the scenarios as follows: Bunker Hill (20), Long Island (16), Hudson Forts (30), Monmouth (16). The attack on Forts Clinton and Montgomery took place in October 1777, so the regiment was most likely in cut-down coats by this time, but the rest of the figures are in full dress. 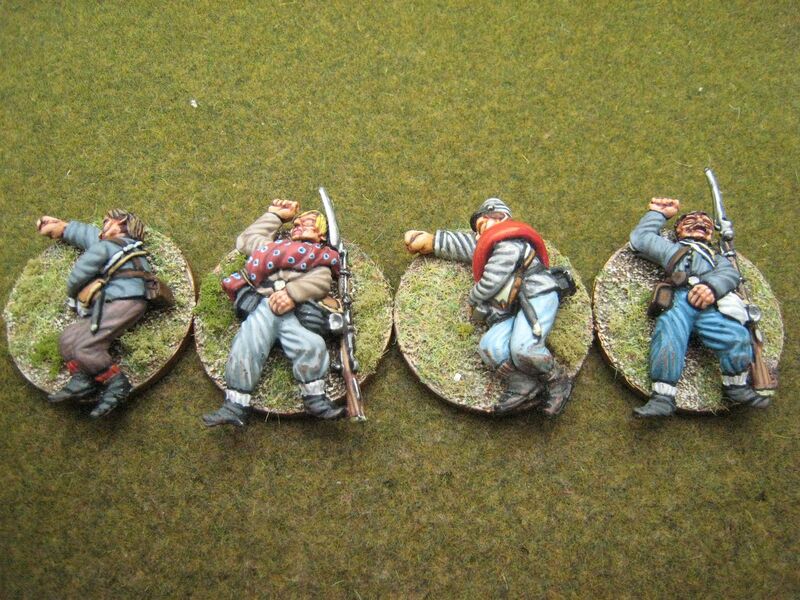 I painted up another base of 4 figures and then put the remaining figures on a base of 6 with an additional officer. I see I need to paint the outside edges of the bases on the older figures. 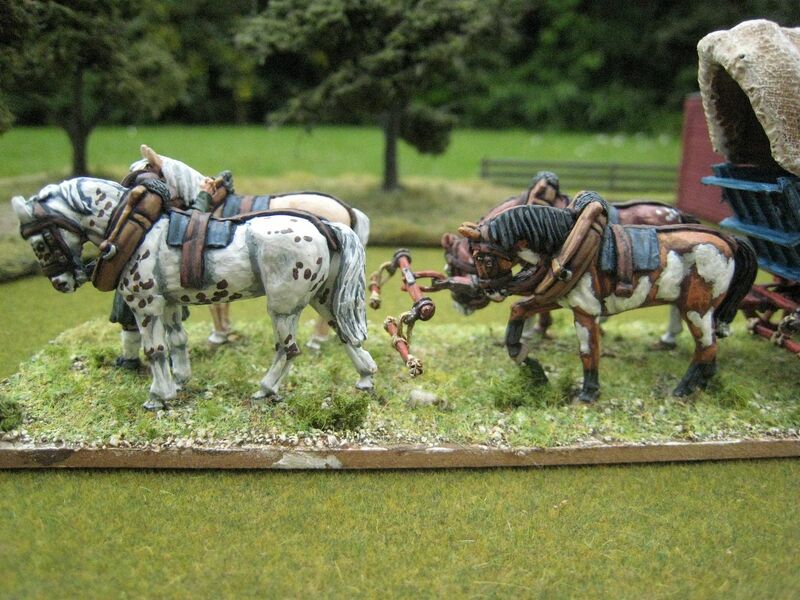 Thirdly, the 49th Foot needed another 4 charging figures to bring it up to 20 for Dorchester. This battalion's scenario appearances are: White Plains (16), Fort Washington (16), Dorchester (20), Brandywine (16) and Germantown (16). 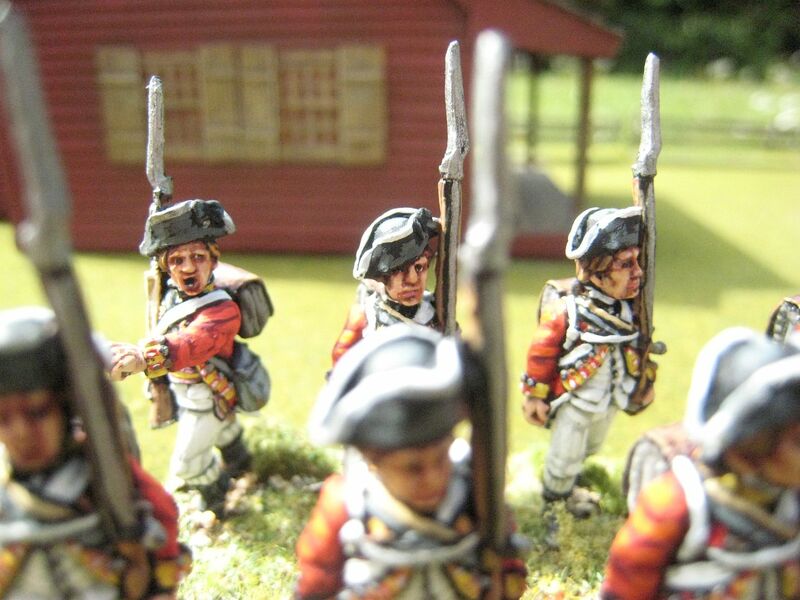 I reckon full dress is ok for the first three of these battles, and again I don't intend to paint the regiment again in campaign dress for the 1777 scenarios. Out of all these older units, I think this one shows the biggest change in style - the way I painted faces back in 2004 was rather embarrassing - oh, that horrid GW "Flesh Wash"!! 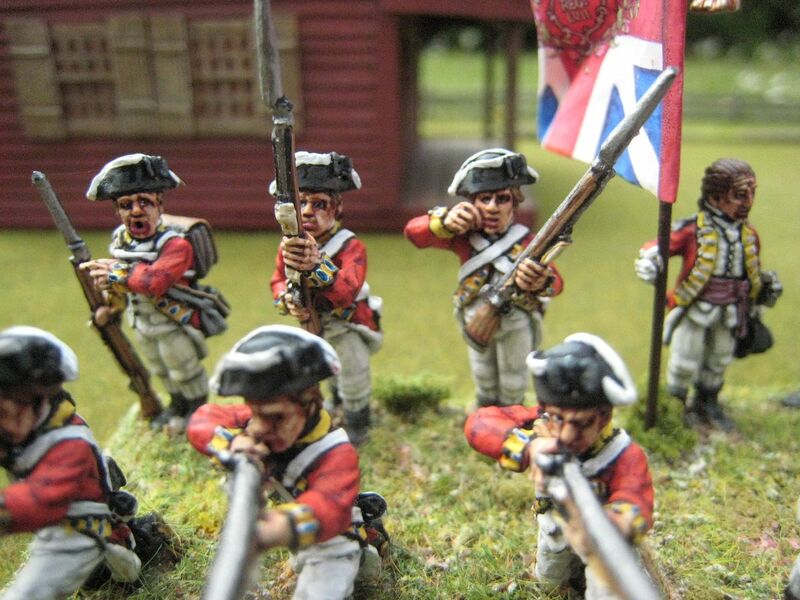 The 57th Foot required a further 6 firing line figures to increase it from 12 to 18. The battalion appears only twice: Long Island (12) and Hudson Forts (18). 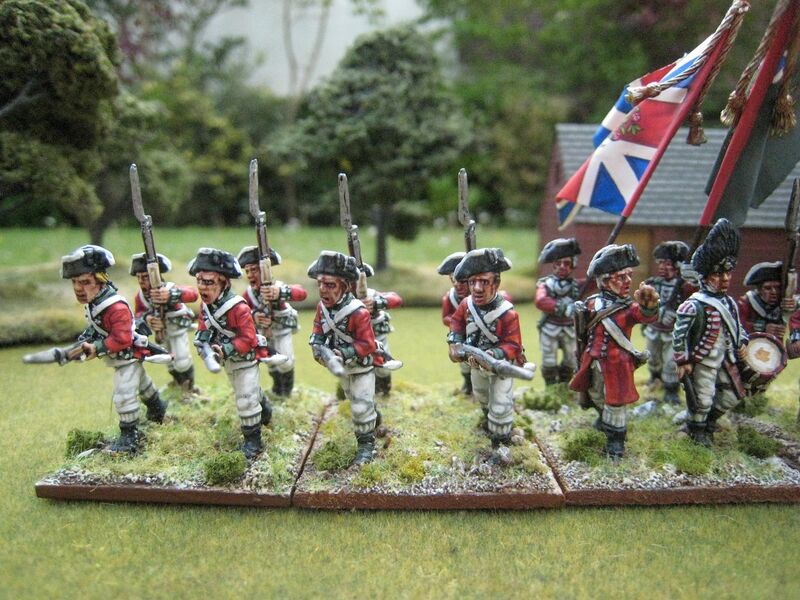 I had this regiment based in fours, so just added a base of 6 figures (including a corporal) to finish it off. 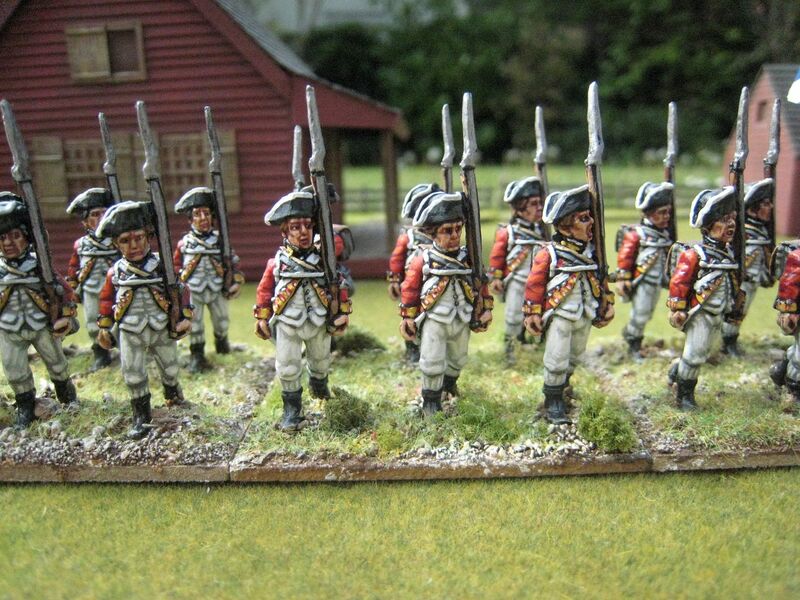 Lastly, the 43rd Foot, which I posted about only recently, needed another 6 marching figures to take it up to 24 figures for the Newport scenario. 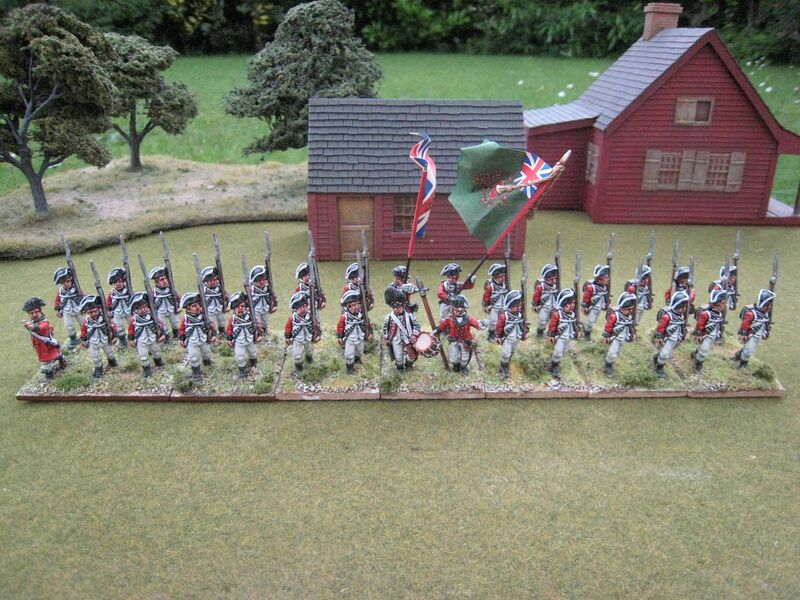 The regiment otherwise appears in the Bunker Hill (18) and Long Island (16) scenarios. - 80th Foot: Petersburg and Gloucester Point (32). 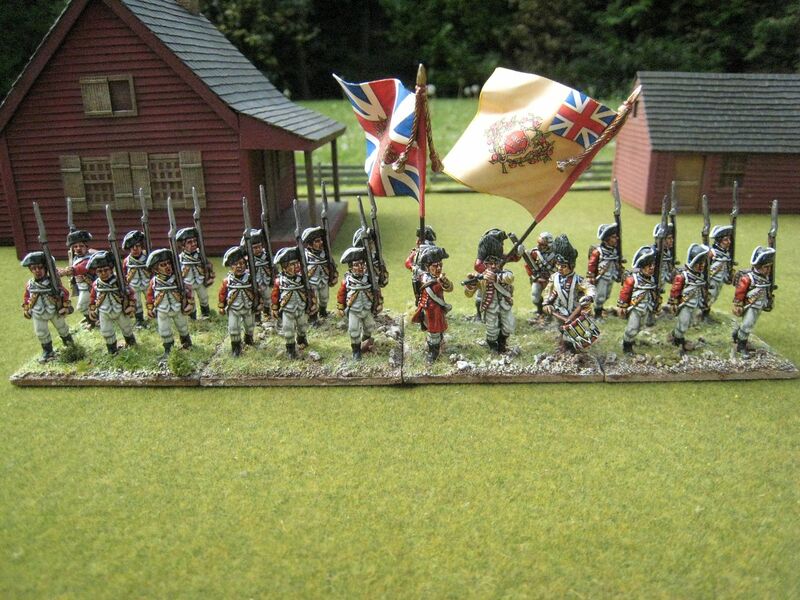 Add a couple of skirmish units and that's it. So 32 line battalions done (plus 6 flank battalions) and 7 left to go. That's not bad. Maybe I should get the boys out for a parade over the summer.....Next on the list will be the 37th and 64th (Perry metals in campaign dress, I think) and the Buffs. 32 figures. Painted March to May 2016. All flags by GMB. All buildings in the background made to order by Tablescape. The 43rd was originally raised in 1741 as Fowke's Regiment of Foot and received the designation as 43rd Foot in 1751. The regiment was sent to America in 1757 and fought in the centre of Wolfe's line at Quebec. After the capture of Montreal, the regiment participated in attacks on Spanish possessions in the Caribbean before returning to England in 1764. The regiment returned to American in 1774. It saw action at Concord and Bunker Hill and then Long Island and White Plains in 1776. 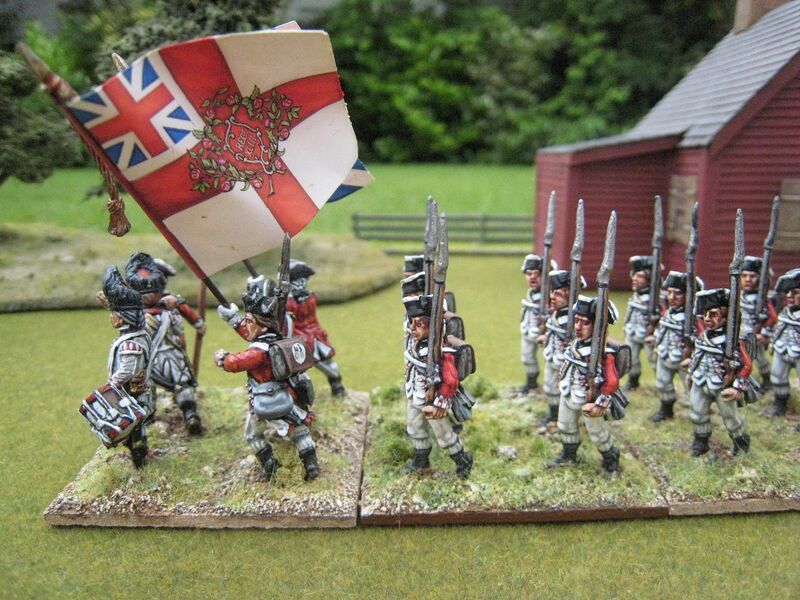 From August 1778 to October 1779 the regiment was garrisoned in Rhode Island. It was part of the army that surrendered at Yorktown. 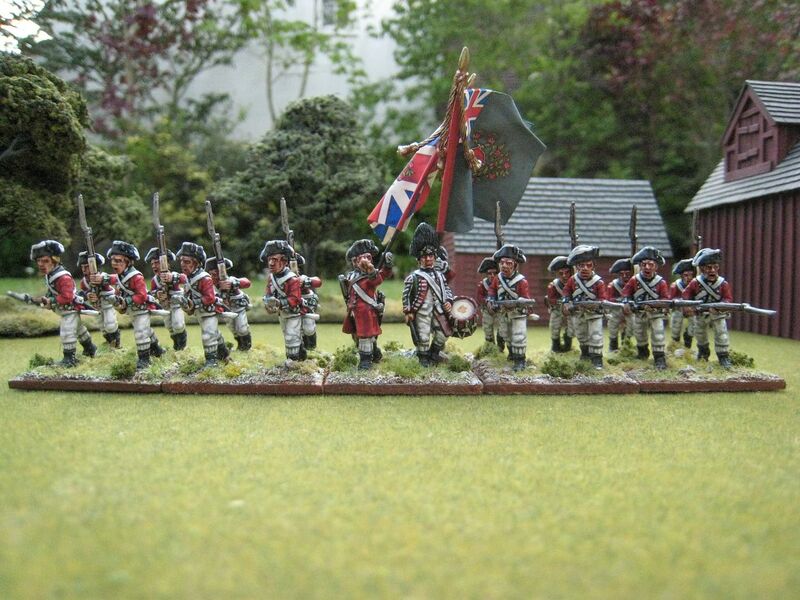 In 1803, and by then with the country name of Monmouthshire, the regiment became one of the first British units to be trained up as light infantry. It participated in the Peninsular War but missed Waterloo as in 1814 it returned to America to fight in the War of 1812. In 1881 the battalion joined with the 52nd Foot to form what became the Oxfordshire and Buckinghamshire Light Infantry. That regiment in turn became the Royal Green Jackets and in 2005 was amalgamated with other regiments to form one of the British Army's super-regiments, The Rifles. This post is a prelude to a much longer post featuring "reinforcement" figures that I have been painting this year. 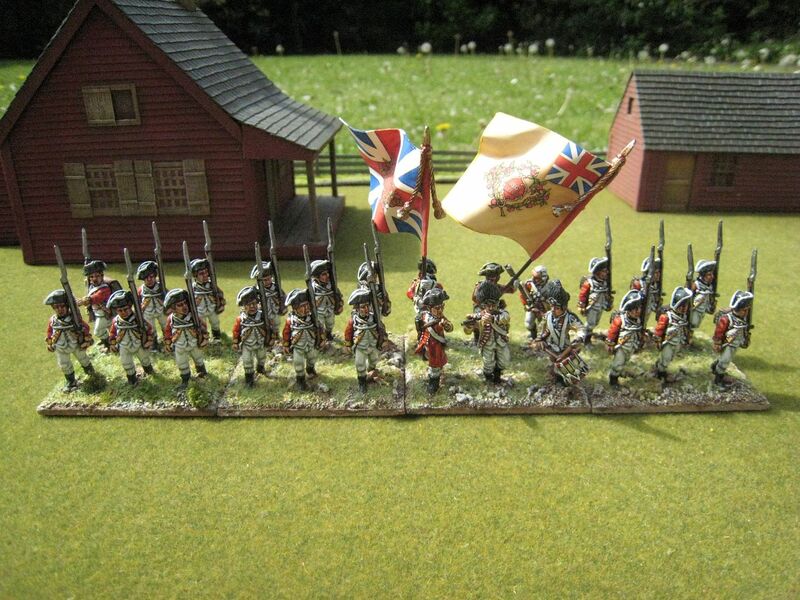 I painted the 43rd in 2003 as one of my first British line regiments. 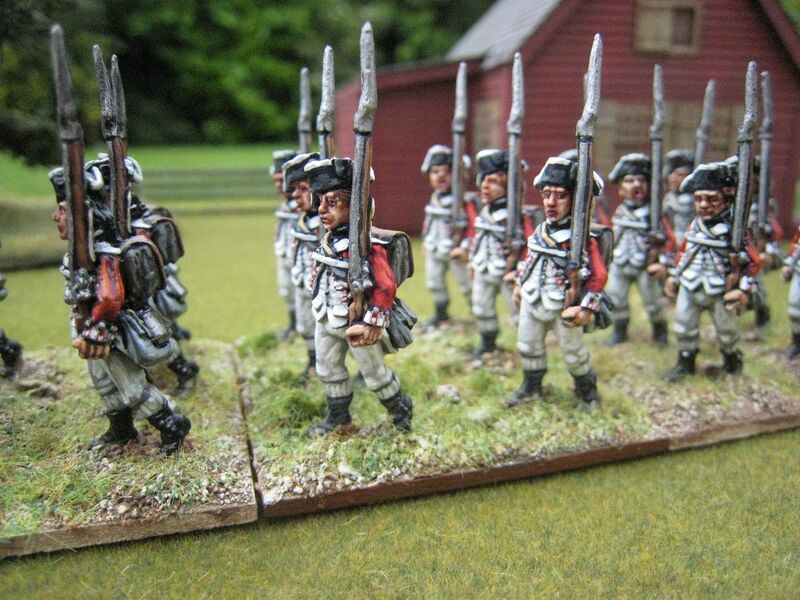 I began my AWI collection with the Bunker Hill orbat, in which this battalion features with a strength of 18 figures. That's why these are Foundry "full dress" figures. The 43rd is also in the Long Island scenario (16 figures) and Newport (24). 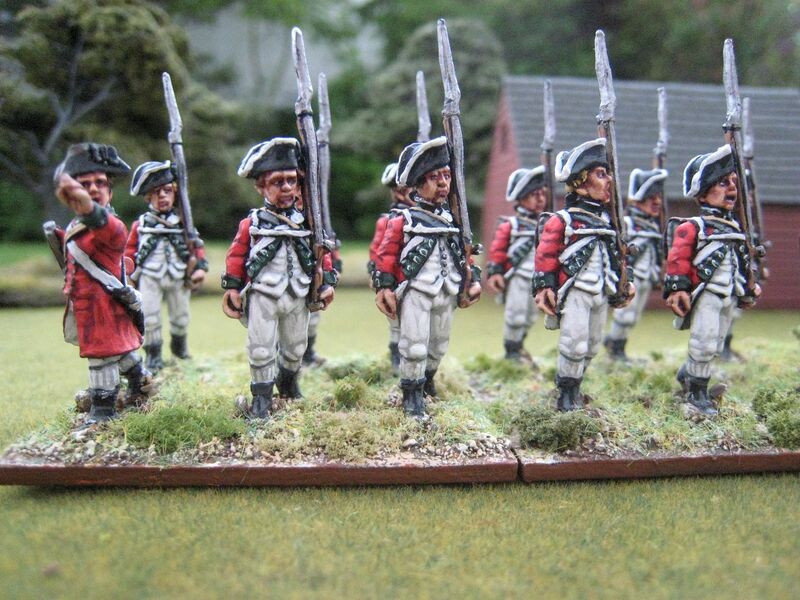 As I had originally painted the 18 figures required for Bunker Hill, I needed to add a further 6 for the Newport scenario, which was only published a couple of years ago. So I painted those extra figures and realised I had never posted about this unit at all. So before I post in depth about the "reinforcement" work I've being doing since March, here is the 43rd Foot. My style of painting hasn't changed all that much in the intervening 13 years - the main difference is the way in which I do faces, which is now more subtle than it was in 2003-5, when I used a GW flesh wash that is more noticeable than the Winsor & Newton inks I use now. My scarlet palette is a bit different - the earlier figures have GW "blood angles red" as their final highlight, a paint which doesn't exist anymore. The flaps on the backpacks have a simple white circle with "43" in black writing. If I'd started these from scratch, I'd probably have tried something a bit more creative. Also, the ground work on the earlier figures is less fussy/busy (which you may well think is better). The ERM bases I use have also changed over the years - they now have a black edge which I paint brown - they didn't use to, so the older figures are easier to spot due to their lighter base edges. 24 figures. Painted 2003 and March 2016. Flags by GMB. 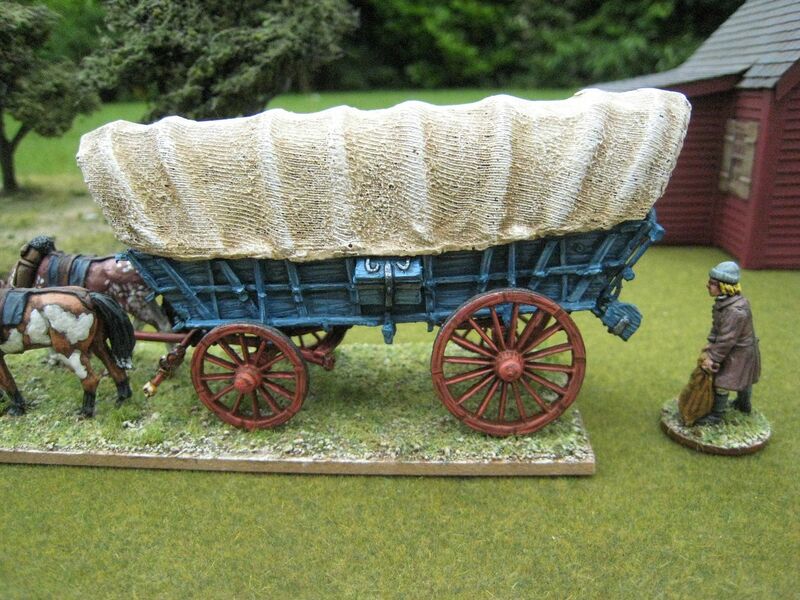 This is the Conestoga wagon from Perry Miniatures. The model represents a type of heavy, covered wagon that was used during the eighteenth and nineteenth centuries in the eastern USA. It could carry loads of up to 6 tons. The name "conestoga" appears to have been taken from the "Conestoga River" or "Conestoga Township" (quite possibly named in turn after a local Native American tribe) in Lancaster County, Pennsylvania, where early wagons were built. The first recorded use of the name was in 1717. A special breed of horse, the "Conestoga Horse" was developed by Dutch settlers to haul these huge wagons. 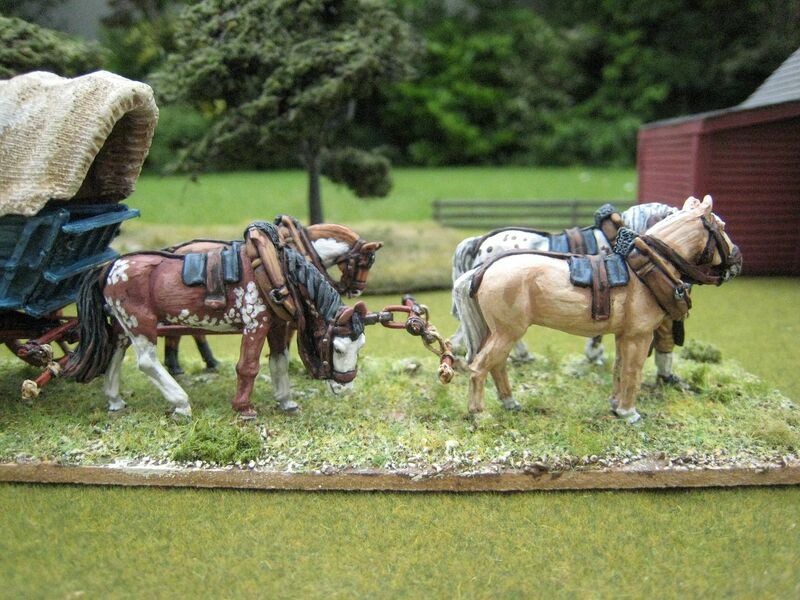 The use of these wagons is one theory why American drive on the right rather than the left: the wagon's driver sat on the left rear horse so he could use his right arm to lash the team and consequently wanted oncoming traffic to pass on his left so the driver could ensure he avoided the oncoming vehicle's wheels. The distinctive curved shape of the wagon helped prevent cargos from shifting around and the large, tall wheels helped river crossings. 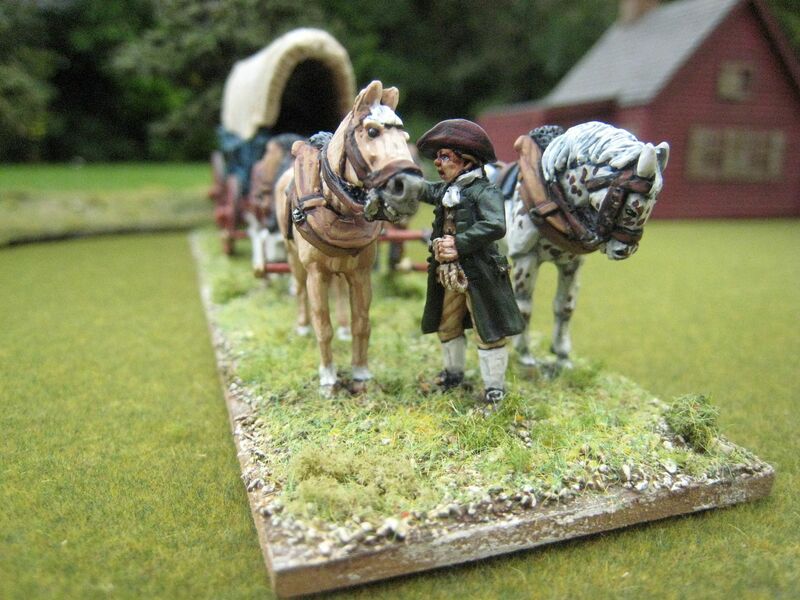 In 1776 Congress created a Wagon Department to help move supplies for the Continental Army. It grew to include enlisted wagoners, but during the AWI probably had plenty of hired civilians who may well have provided their own wagons for temporary military use. 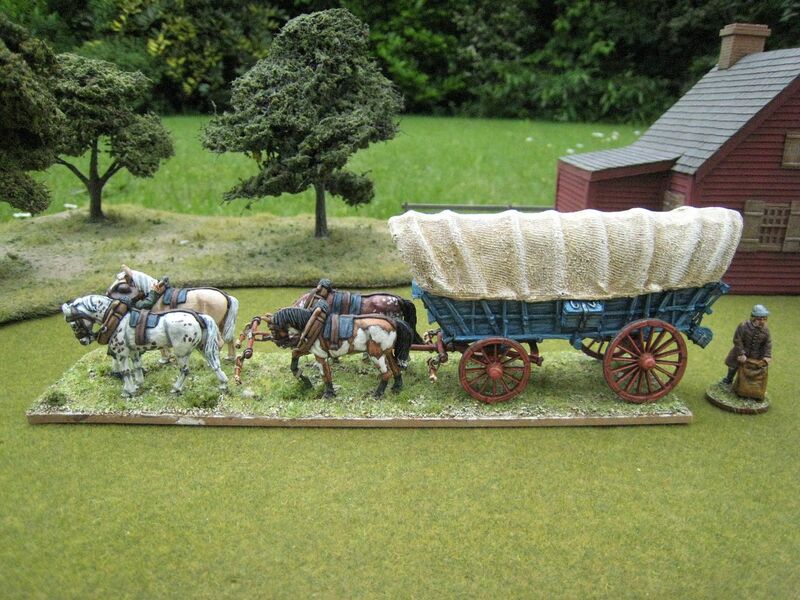 So this model (a kind gift from wargaming friend Timmo) is for use as a supply wagon for my Continental armies. I painted and assembled this set over 2 days' off work I had a couple of weeks ago. When painting horses nowadays I like to work from photos, particularly when doing some of the more "funky" colours that I do for American horses. I chose a bay overo, an appaloosa, a chestnut sabino and a palomino. Overos and palominos are staples for my American cavalry units, but it's been a while since I've painted an appaloosa and I don't think I've ever painted a sabino. - palomino: base colour of Foundry "Palomino 56" with mane and tail in "Austrian White 67". - collar: Foundry "Dusky Flesh 6" and "Spearshaft 13" for the wooden support. For the wagon itself, I looked at various photos on the internet to see whether I should go with "natural" or painted woodwork. Examples of the latter included blue, red and green. I settled on what I think is quite an attractive colour combination: mid-blue for the bodywork and then "red oxide" for the chassis and wheels. 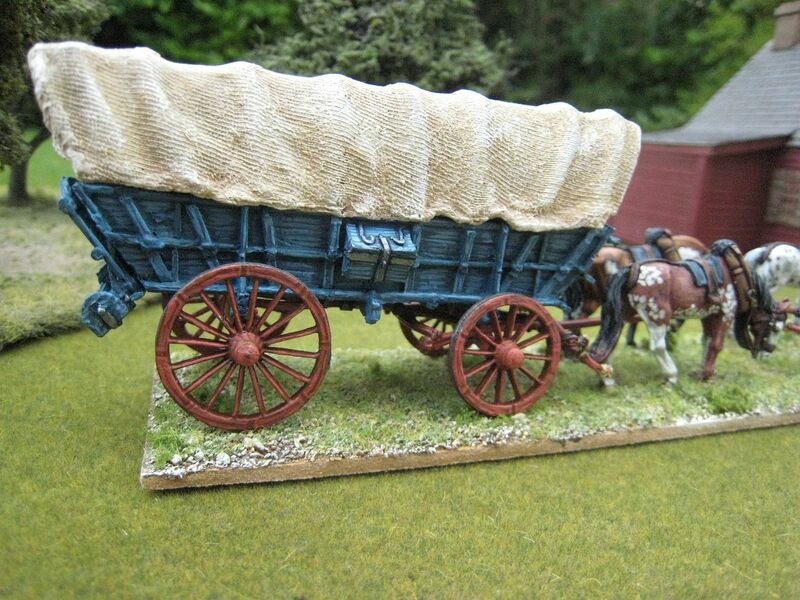 The (resin) canvas top of the wagon was painted with the Foundry "Canvas 8" palette. I needed two coats of the A colour and then heavy dry-brushing with the B and C colours. 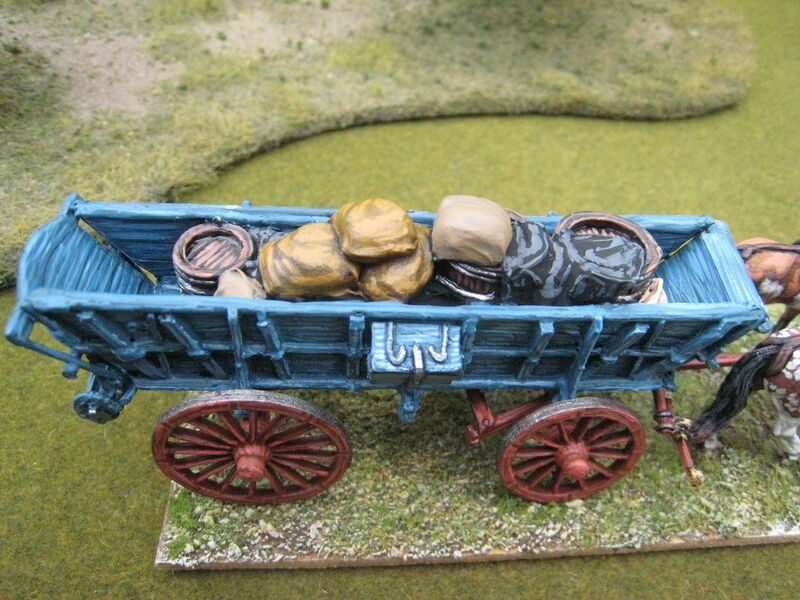 The main palette colour I used for the wagon itself was Foundry "Prussian Gun Mid-Blue 106". The base coat was the A colour; I left out the B colour and did some wood-grain effect highlighting with the C colour and then C plus white. For the sacks I used various Foundry colours: "Palomino 56", "Deep Brown Leather 45", a couple of WW2 palettes that have been discontinued, and then "Spearshaft 13" for the barrels. It's a bit difficult to work out precisely what is in the wagon other than the clearly-visible sacks etc. There's a tarpaulin there, so I assumed that would have been rain-proofed and painted it black. 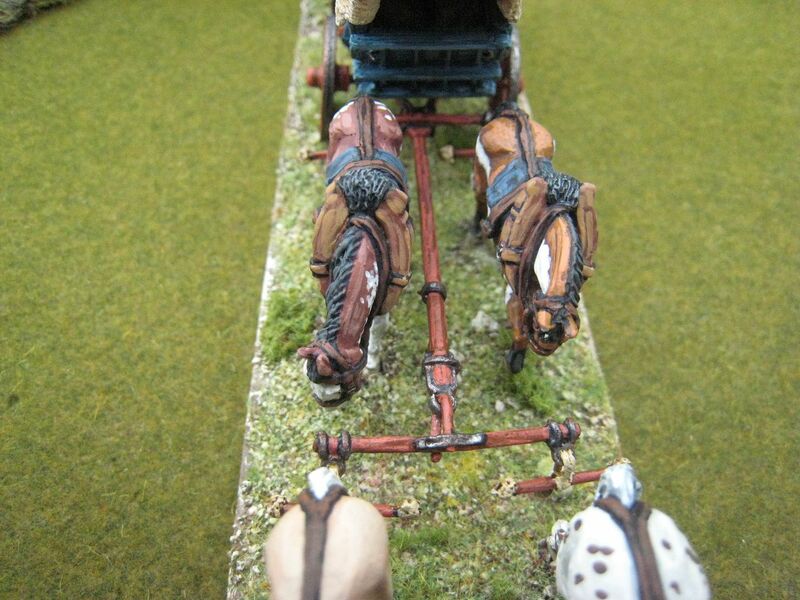 The chassis and wheels were painted with Foundry "Terracotta 37". I'll add some traces at some stage, but I wanted to get this photographed while I had a spare moment and it wasn't raining. I'm pretty sure the chap at the front is in the wrong place, but I didn't have enough room on the bas to put him to the right side of the front right horse, which is where he stands in the pic on the Perry website. There are a couple of other mistakes: the metal work is too bright I think, and I'm really not sure about that the yokes are in the right place - I found these bits very difficult to sort out and almost superglued my fingers together several times. I also found the resin rather brittle - a couple of bits broke off but I couldn't tell whether they were part of the kit or just flash. But overall I think this is an excellent model from the Perries and it's worth taking the time to put it together. 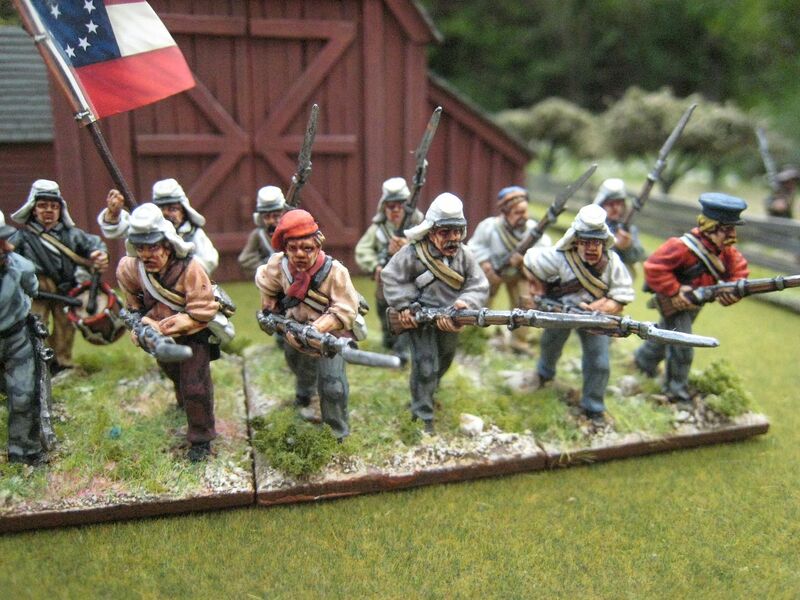 It's the sort of thing, along with ammunition carts and limbers, that will always appear on the table. So it turned out to be a month with a missing 4 weeks in the middle, but that was ACW week here at Tarleton's Quarter. 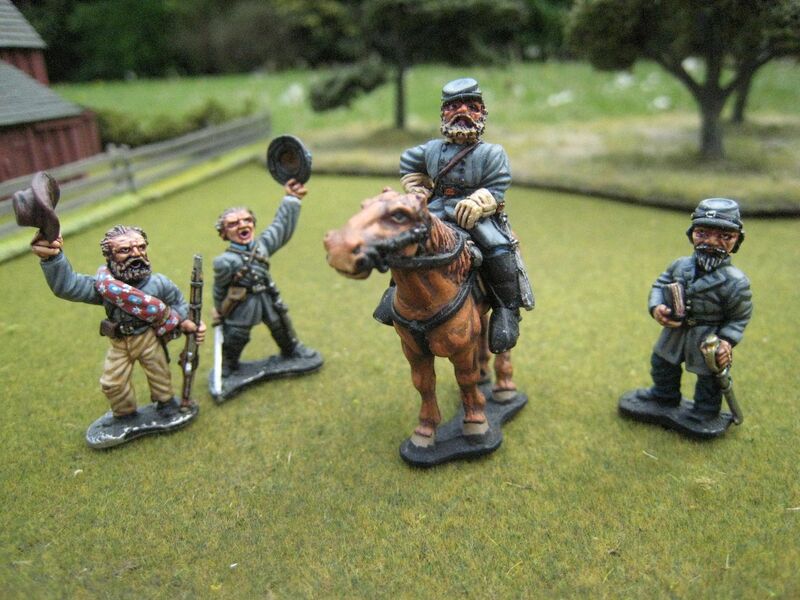 I wouldn't say that the ACW bug has necessarily been caught, but I enjoyed inspecting these units again and I am working on another regiment of Dixon Virginians. I still have plenty of Dixons in the leadpile, so I will return to the period at some stage. For the immediate future, however, I'm back at work on AWI stuff, and I'll post about some of that towards the end of the week. 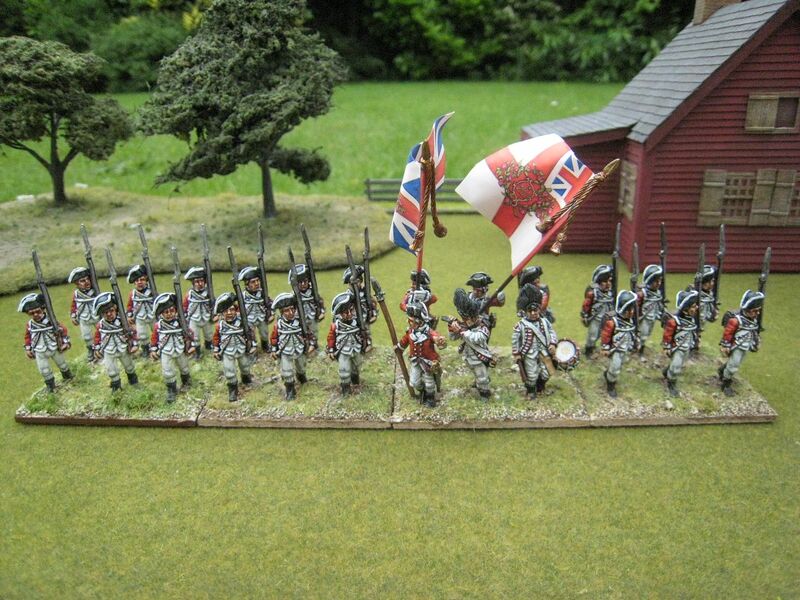 To the left are some Dixon Miniatures casualty figures, one of which was painted back in 1998 and the others in 2013. Something else I've been working on is a command stand for Jackson himself. The photo below shows where things are at the moment. Jackson himself isn't quite finished, and I keep changing my mind about who else to put on the stand - whether a mounted standard bearer, for example, or the foot figures I have here. My thinking behind the latter is that the cheering figures would represent Jackson's popularity with his troops while the chaplain would represent his commitment to the Presbyterian faith. I was intending to add a standard bearer with a Virginia flag as well. Any ideas or comments welcome as I really can't make my mind up! 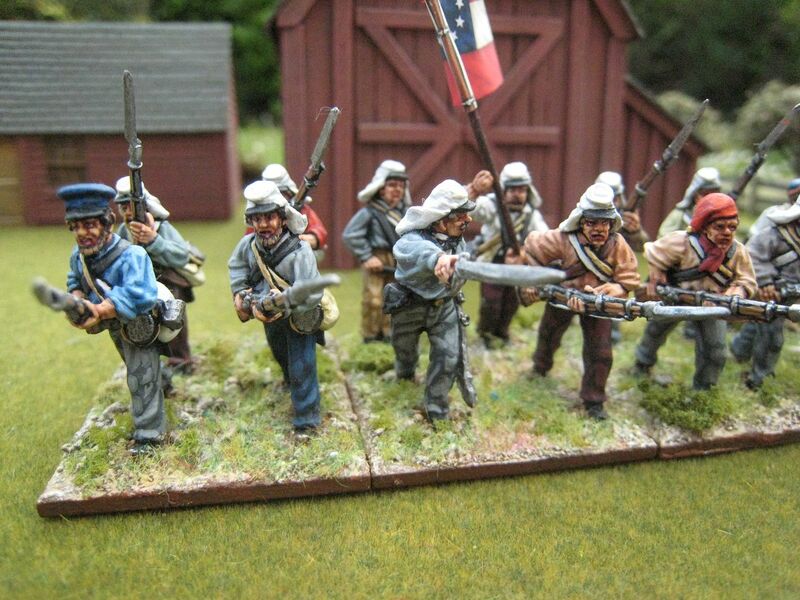 Picking up as if nothing has happened....this is my second unit of 1861 Rebs, again intended as part of the Stonewall Brigade. The figures are from the same Perry Miniatures packs as my previous unit, but with the other half of the figures from the command pack. 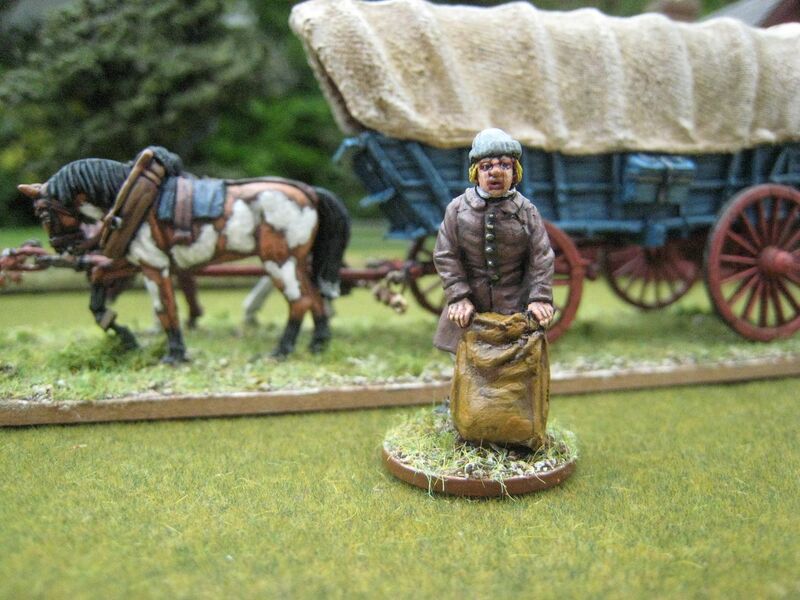 The Perries are releasing more ACW packs now, after a bit of a hiatus. I recall them announcing some time ago that more "Bull Run" packs were in the works, and they have just released Rebs in frock coats and hats. So maybe I'll get around to painting some of those figures at some stage. Apologies for the delay of 5 weeks since my last post. Various things pretty much "fell off a cliff", to be honest (including the obvious recent events). However, I'll post more regularly now and I have some interesting AWI things to follow my final ACW post which I'll add tomorrow. Happy Independence Day, everyone! 16 figures. Painted December 2012-January 2013. Flag by GMB.